The door to the Dream House is like any other door. I walked up and down the same block in Manhattan three times before I noticed the door and a doorbell beside it with a piece of paper taped to it labeling this doorbell as the doorbell of the MELA Foundation/The Dream House and to not leave any packages even though there were four phone books stacked on the steps. After walking up a flight of stairs, a young woman who sat in a chair asked me if I knew what to do. I said yes, but I didn’t really. She told me to take my shoes off. I’d never heard of the MELA (Music Eternal Light Art) Foundation’s Dream House until the bombarding began. Suddenly everyone was insisting I go the next time that I found myself in NYC. La Monte Young and Marian Zazeela are partners/collaborators that have worked together for decades. Their works seem to always work toward eternity, peaking with The Dream House. Young is a monumental minimalist composer, often credited with being the father of drone music and on par with the innovation of John Cage, though his name doesn’t ring as many bells. Marian Zazeela is a sculptor, installation artist, and a vocalist, but I always want to describe her as a lightist, or something beyond a light artist. The Dream House seems to have always existed and will always exist. The pair have done away with the typical arc of time, living on their own clocks. For them, the waking day goes on for over twenty-four hours. I have heard that people who work for them get frustrated; their sleeping cycles swallow the calendar. Sometimes you have to get started at 4AM or 4PM. You catch on after a while. The Dream House is almost a peak into their minds, wavering against and between sleep and time. When you open the door to the Dream House you are in the hallway of the Dream House and you know this when you look up to the ceiling and a neon sign tells you you are inside the Dream House in all four directions. Everything is seemingly cast in fuchsia light, most concentrated in the center of the walls, but it is really just a batter of blue and red light wrapped in foils and mixing with each other. The carpet is maybe white but it is impossible to tell and maybe most people might be reluctant to use any of the pillows strewn around the two rooms that you can use for…whatever. You can do whatever you want inside the Dream House, except you can’t wear shoes and you can’t take pictures. If you go left you are in the bigger room of the Dream House and there is a small altar with consistently burning incense below a few framed photos of Young’s guru, Pandit Pran Nath, whom he and Zazeela lived and studied with for over twenty years. There are enormous amps in each corner and they each emit the same single tone. If you go right you are in the smaller room of the Dream House. 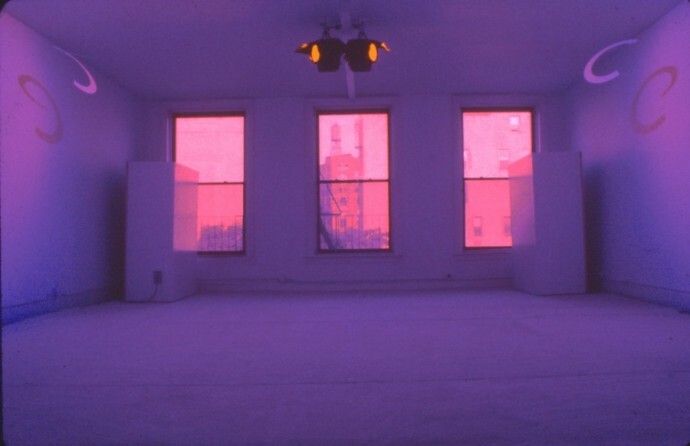 The same fuchsia light is focused in the center of the wall, but this wall has a rectangle sculpture at its center which casts various purple shadows. You can sit on a pillow in the center of this room and stare at the rectangles on the wall until they lose their third dimension and just look like they are painted on the wall. Then they stop looking like rectangles and you can mostly only see their weird purple parallelogram shadows. Then it is probably time to go back to the big room. While I was there, a guy was in one of the corners practicing yoga, so I didn’t feel weird rolling around and crouching and lying down. Even though it’s a single, constant drone tone that plays, wherever a person is in the room, up, down, this corner, that corner, the middle, etc., the sound seems to change. Things get very wavy. I kind of wish there was a video of me. Sometimes the sound feels swallowing, like walking towards “the light.” If I tilted my head sideways I felt like a sloshing fishtank. Crouching down sounded different than standing up sounded different than lying down. Finally I just lied down. It felt like it had been years since I had lied down on a carpeted floor and it obviously felt more forgiving than tile or wood, but even more so after getting jellied by the sound. I lasted about ten more minutes on the floor before I started to feel extremely nauseous and I had to get out. I wish I knew what time I got to the Dream House. Before going into the Dream House, I had told a friend in my MFA to take a class with C.D. Wright because it was maybe one of the last chances to take a class with her since she was thinking about retiring. I know when I left the Dream House, it was dark, and another friend in my MFA called to say that C.D. Wright was dead. I’ve been back to the Dream House, spent a whole day in the Dream House, watching people sleep off their dumb brunches or make out on the floor while I sat in the corner. I watched a ballerina from Russia throw herself all over the room. I think a movie star came in at some point; people in their half-sleep stirred up and stared. A lot gets lost in there. Some people walk into the Dream House and look around both rooms for thirty seconds or so then leave, thinking they have seen all there is to see, heard the floating tone, seem confused or bored. Some people sit and look around constantly, waiting for something to change or someone to surprise them, anxious and anticipating that which will never come. In that way the room is part-canvas for thought and part-mirror for the way in which you create it. The Dream House will go on existing despite the rising rents in Manhattan, the same way as light and sound go on forever. 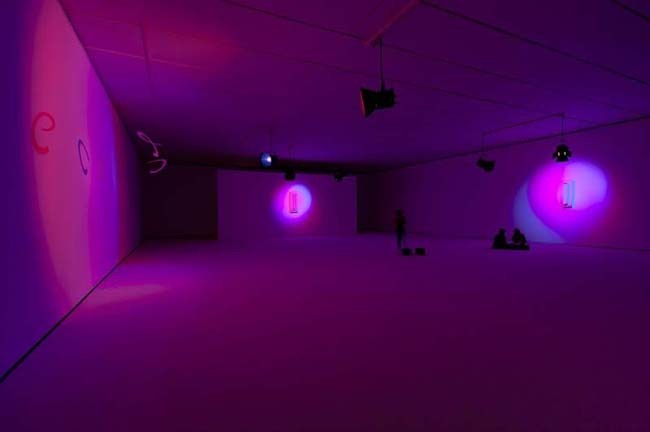 The wavering room created by La Monte Young and Marian Zazeela will go on because they’ve recognized the holes and gaps that go on, reflecting the humming inside our heads when light and sound compress into thoughts and ideas and moving pictures and memory. The Dream House is as stimulating as it is paralyzing, as unsettling as it is serene.